WASHINGTON — Besides being proficient at the work they do, NHL trainers also need to be efficient. Timeliness is key when it comes to patching up a player’s bumps and bruises and getting him in good enough shape to resume regular shifts. It’s a reality that Flames forward Matthew Tkachuk knows all too well. The 20-year-old, now with two seasons of NHL experience to his resume, has shown a tendency to stick his nose in places where it could be compromised — or worse, bloodied. Matthew’s younger brother Brady has known these conditions to a lesser degree, but the ante will be upped when he makes the jump to the NHL. 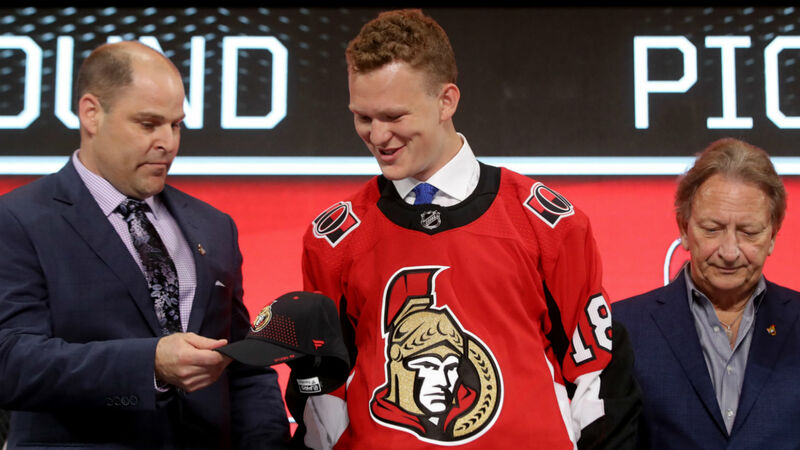 That could come as early as next season, after Brady was selected fourth overall by the Senators in the 2018 NHL Draft. Except it’s not a concept unfamiliar to Brady at all. Rewind to their childhood, which included many nights spent in the wives’ room of St. Louis’ then-named Savvis Center while dad Keith scored 143 goals for the Blues across parts of six seasons. Brothers will be brothers, and hockey brothers will be even more brotherly. So during one of those nights, the Tkachuk boys started a two-on-two game with mini sticks, a regular occurrence for them. But on this particular night, a Tkachuk-on-Tkachuk crime — Matthew checking Brady from behind — launched younger brother face-first into the couch. The metaphorical gloves were dropped. It wasn’t just Matthew and dad Keith that Brady had to lean on, though. Their running mates and childhood posse included Clayton Keller, Luke Kunin, Logan Brown and Trent Frederic, a hyper-skilled group of aspiring youth players all born within 21 months of each other and all living in close proximity in Missouri. They competed on many of the same teams, birthdays breaking them up into separate groups, and also touted an equally qualified coaching staff, spearheaded by a trio of former NHLers Keith Tkachuk, Jeff Brown (Logan’s father) and Al MacInnis. The lessons they learned were perhaps subtle in the moment, but ingrained a new line of code into each player’s hockey microprocessor, impressing upon them the small things to do to become successful professional players. “He always told us to shoot somewhere other than high glove or high blocker,” Keller said. “He wanted us to shoot to other areas of the net than that. We all kind of thought he was crazy at the time because everyone loved getting the puck off the ice. The Tkachuk boys taught each other plenty of lessons, too. They were wildly competitive, be it in the wive’s room, the driveway or the Blues’ locker room. The competitiveness seeps through when watching Brady or Matthew play. They have a certain air about their style, which some might choose to characterize with colorful, anatomical language. To players who embody that type of role, it’s one of the highest forms of compliment. Brady said Matthew is the better trash-talker. But Matthew said that after Brady was selected fourth — two spots higher than the Flames took the older Tkachuk brother in the 2016 draft — there was no pointing out that fact. That brings up another question in Brady’s development arch. He hasn’t announced where he’ll spend the 2018-19 season, and he’s yet to sign an entry-level contract. He could return to Boston University for his freshman season. At 18 years old (19 in September), he could also spend the entire year in AHL Belleville and still see his entry-level contract slide to 2019-20 — or play 10 or more games with Ottawa at the NHL level and burn that first year. There have also been rumors he could head to OHL London, where the Knights own his rights, especially after Brady’s freshman-year coach, David Quinn, left Boston University to take the Rangers’ head-coaching gig this summer. Keller’s amateur resume reads eerily similar to Brady’s, from the minor midget teams in St. Louis, to two years with the U.S. National Development Team Program, to a year on the campus of Boston University. But there’s no lack of confidence or belief in ability when it comes to Tkachuk’s game. When some tried to typecast him as a pure agitator, in a similar ilk to his brother, Brady was quick to defend the other selling points of his game during the pre-draft process. Tkachuk’s freshman scoring numbers were not eye-popping. Even as one of the youngest players in all of the NCAA, he tied for seventh among those collegiate newcomers in scoring, with 31 points in 40 games. But his point-per-game rate of 0.78 is on par with some recent college freshman like Blake Wheeler (.080), Alex Tuch (0.76) and Chris Kreider (0.75). Tkachuk’s biggest moment of his draft-eligible season came not in a college rink, and not even indoors at all. During the 2018 World Junior Championships, Team USA squared off against Canada in the snow at Buffalo’s New Era Field in a showdown between the two rivals. With the U.S. trailing 3-2 in the third period, Tkachuk scored to tie things up. He also converted later in the shootout to help secure the victory behind a snowy backdrop. It was a huge moment for both player and family in what’s been a whirlwind couple of years in the Tkachuk household. Things were always hectic growing up, but they’ve taken on a different form with two brothers becoming NHL draft picks in quick succession. Keeping up with such a high level of competition can cause stress for any family, but Matthew’s uncanny ability to repulse opponents exposes a whole new level of anxiety. He already has been suspended two games for elbowing the Kings’ Drew Doughty, which later led Doughty to say Tkachuk is the NHL’s most hated player. It hasn’t always made for an enjoyable viewing experience for their mother, Chantal. If anything, for years, he’s had a great litmus test in brother Matthew when it comes to “dealing with it.” The third-year Flames forward has already proven himself to be one of the league’s most effective thorns, and when it comes to brothers, no one else knows quite how to push someone’s buttons. But make no mistake: The Tkachuk boys know it’s a weapon in their arsenal — one that comes with certain benefits, even with such a physical toll. “They had a pretty nice setup there with a rink in the basement and a nice driveway,” Keller said. “I don’t think any of us would be where we are today without those guys,” he said.